U1A LF353 opamp turns on a buzzer when the voltage at Test + falls very low indicating a short between Test + and Test - or a resistor less than 5 ohms. The R9-R14 divider determines the minimum voltage that can be at Test + for buzzer to just turn on. The Opamp here is a comparator and R10 10 Meg gives a very small hysteresis so that there is no oscillation at threshold levels, that is when both inputs at same levels.The Zener is for protection and R6 to limit current. U2A and U1B opamps form a precision rectifier, note that this is not a true RMS rectifier circuit for that see some devices from Analog Devices. When you need to rectify a 200mV AC signal you cannot use a diode like 1N4148 as the diode turns on at 700mV so this circuit is used. The AC signal measurement is best to do with a True RMS convertor. This Type is able to quantify the Heating power of a AC voltage, includes all harmonics and Noise too. This is a unregulated supply for low power circuits. You may be able to regulate the outputs with zeners or small regulators like 78L05. The transformer can be hand wound in a mini ferrite pot core. you can use 2N2222 or any other fast transistor. The transformer should have 1KV isolation. The dot polarity of TR1 should be properly observed, else it may fail to oscillate or give output. 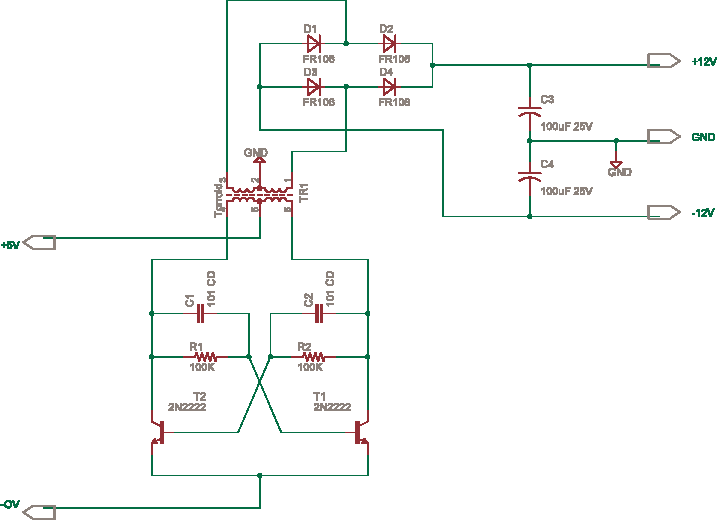 design for, any fast switching transistor would work, no regulation, use regulators like 78L12 if you want, circuit like multivibrator used for flashing LED lights.